Hope you made it to the Mentone 2018 Monster Mash. Stay tuned for Mentone 2019. On the third weekend in August each year, Birmingham FOOTMAD puts on its annual Old-Time Music and Dance Weekend at Camp Riverview in the resort town of Mentone, Alabama. Riverview has a beautiful, open-sided, wooden-floored dance hall and a waterfront on the Little River, whose chilly waters feel great in the late August sun. For the past 30 years, the weekend has featured great old-time bands and musicians such as James Bryan and Norman Blake, Lotus Dickey, Ralph Blizzard and the New Southern Ramblers, the Freight Hoppers, the Red Hots, Big Hoedown, Red Mountain White Trash, the Monks, Notorious, and many more. 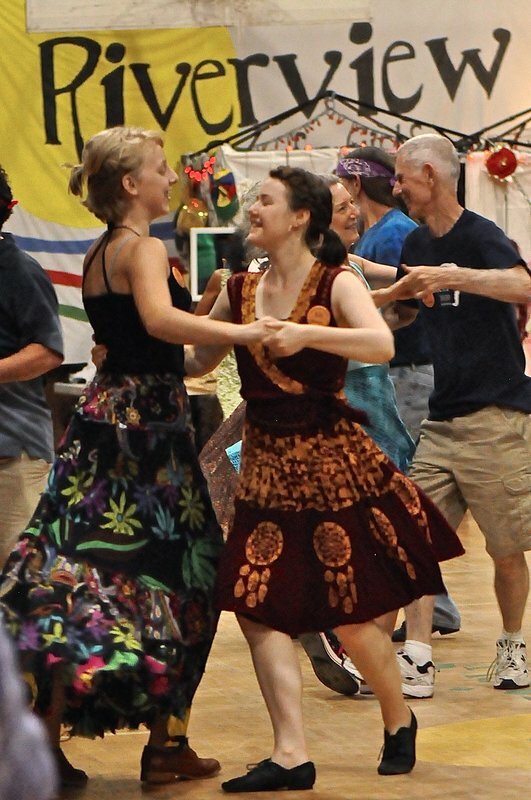 The core activity of the weekend is dancing, but also on the schedule are jams (slow and regular), a concert by the featured band, a late-night swing dance, Sunday morning gospel singing, a swing dance workshop, swimming, and a wacky waterfront drama or pageant. Dancers stay in cabins or bring their own tents. Some also stay in bed-and-breakfasts or rent chalets in the area. FOOTMAD furnishes two breakfasts and dancers are asked to bring a contribution to the Saturday night potluck and any other food or beverages they need. Everyone at the camp is expected to volunteer for a congenial bit of cooking or cleaning during the weekend, which helps FOOTMAD keep costs low. After you've registered, received a confirmation flyer, and joined us at Camp Riverview, you’ll find the Old-Time Music and Dance weekend an incredibly fun and friendly affair! You may want to check out videos from past Mentone dance weekends. If you do not receive the Mentone announcement you can request placement on the Mentone email list by filling out and submitting the form below.